Today was a really dull day and I was feeling quite low too. In fact the only exciting thing to happen was finding coffee in Asda reduced from £2.93 to 57p – result, I bought 2! Could have done without the hamster biting me though! If You read this blog regularly (as if!) 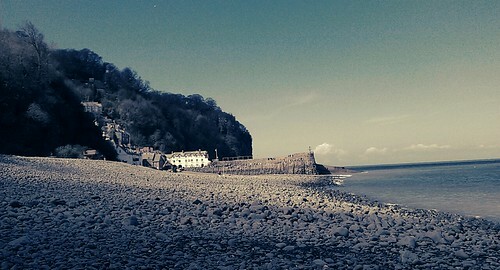 you may recall that we visited the old village of Clovelly earlier this year when we were on holiday in Devon. 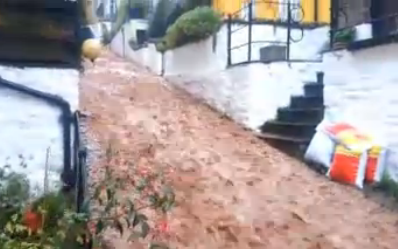 Today it was hit by a flash flood which saw a torrent of water streaming down the ancient cobbled streets towards the sea where the harbour turned brown from the mud being washed off the hills. It seems quite odd to see somewhere you’ve visited recently flooded in this way but bizarrely it’s not the first time this has happened. We visited Boscastle in 2004 a couple of weeks before the now infamous flood which devastated the village. I’m starting to think this is my fault!